Our precision-tested tuning forks are easy to learn, simple to use and the healing benefits are miraculous. Specially tuned to sacred proportions, you sit inside the space bringing two different sounds together making them one-and you feel unified, at peace, re-igniting the passion and power deep inside you. When you tap the tuning forks, you awaken the life energy of your cells and start them puffing, creating a centered, happy feeling inside. How Tuning Forks Are Used? When you strike a tuning fork however, you’ll notice how it causes the air around the fork to vibrate, sending out very strong vibrating impulses through the air. Because of this, they have been adopted by healers who use them to increase the amount of energy on parts of the body they are trying to heal. Should I choose Standard or Weighted? Standard tuning forks are great for vibrational healing such as sound toning, and for working with energies, such as opening energy blocks, clearing chakras, or cleansing auras. In the process of promoting the flow of vital life force within the human body and the human energy field, they are intended to assist and facilitate clearing, balancing, and energizing the energy body in a simple and gentle way. Standard tuning forks also have the unique quality of being able to produce harmonic intervals (multiple pitches that occur at the same time) when struck together. Weighted tuning forks don’t produce harmonic intervals as easily, however they have a much stronger vibration, making them easier to feel, and excellent for uses such as acupuncture, sound puncture, and muscle relaxation techniques. 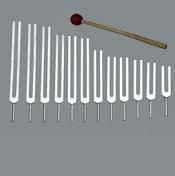 In addition to their own sound and vibrational healing qualities, weighted tuning forks can physically transfer their frequency of vibration to the body by using forced resonance, or by directly applying the handle (also called stem) of the tuning fork on the body at point of focus, such as a meridian or chakra. This is a way of creating movement or frequency vibration in any area of the body, and as such, weighted tuning forks are known to give immediate relief from pain when used with interferential therapy techniques. 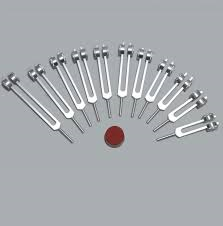 Weighted tuning forks vibrate for longer periods of time, and stay at their exact frequency longer. This makes them great for accurate or precision tuning or toning when doing sessions on yourself or others.